The Oxford Foundry, a new entrepreneurial hub at the heart of Oxford University, has officially opened its doors. The facility will be launched today by Tim Cook, CEO of Apple, Inc. The student-centric venue aims to build a community of innovation across the University, inspiring and supporting Oxford’s 23,000 students to develop their entrepreneurial skills or create and scale commercial ventures. The Oxford Foundry will embrace students across all academic disciplines from engineering, medicine, history, philosophy and more. It will be a place for students from different backgrounds to experiment, learn from one another, and generate ideas and initiatives that address business and societal issues: whether their ambition is to launch their own start-up or to develop an entrepreneurial mind-set to drive innovation from within an organisation. Students will be encouraged to play a major role in designing and leading activities. As a world-leading university, Oxford University has produced more founders of Unicorn businesses ($1 billion upwards) than any other in Europe, and has a strong history of students launching and establishing successful start-up companies. The Oxford Foundry will support the institution to continue to translate its academic research into innovative solutions with commercial and societal impact, on an international scale. The Oxford Foundry will bring world renowned and inspirational figures to speak to students, creating an environment that encourages the exchange of ideas and views on the role of entrepreneurship and future ways of working. The Oxford Foundry will have a student advisory board and partnerships with student societies across the University, including Oxford Entrepreneurs, Europe’s largest society for entrepreneurship with over 10,000 members. Students will be able to take part in problem solving competitions and workshops on areas such resilience, leadership, and digital skills. The Oxford Foundry will also work with both community and corporate partners to try new things and put ideas into practice. Each year the Oxford Foundry will support the starting and scaling of a select number of student ventures. Support will include dedicated working space at the Oxford Foundry, access to networks, industry experts and back office support. The Oxford Foundry is housed in a renovated Victorian ice factory in central Oxford and is spread over two floors. 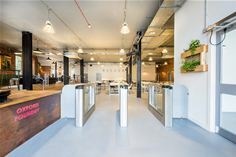 It offers co-working space, presentation areas, and a café at ground level – enabling entrepreneurially-minded people to meet, collaborate, create new ventures, or build the skills to bring innovation into their careers. Upstairs, there is an incubator space for accelerating new ventures. The Oxford Foundry has been made possible by the generous support of the following major donors: Reid Hoffman, Co-founder of LinkedIn, the Amersi Foundation, EY, Barclays, Meltwater Fairhair.ai, and DeTao Education Group. An Advisory Board, chaired by Brent Hoberman, will bring expertise, insight and advice to the Foundry community. The Oxford Foundry is a brand new entrepreneurial hub at the heart of the University of Oxford. It aims to support all 23,000 students across the University – whether they are lawyers, medics, engineers or philosophers – in becoming more entrepreneurial people. A key focus is to enhance employability through entrepreneurship amongst students, as well as create an ecosystem to support the starting and scaling of ventures that will have valuable social impact on our world.